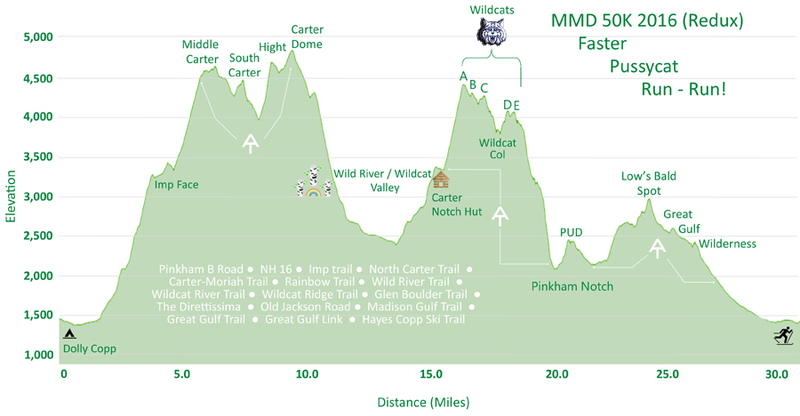 - In 2016 I tweaked my knee twelve miles into the MMD 50K run in the White Mountains. The result of the knee injury was I was unable to run and had to hike the remaining twenty miles. It was pretty demoralizing since I was running really well that day. So a little over a year later I decided to head back and rerun it to see how I would hold up when healthy. - MMD is held in early August but the weather on this October day was eerily similar for the start, wet from overnight rain and humid. Luckily, by the time I reached Mount Hight the clouds blew off and I had some great views. An added bonus was seeing peak foliage during most of this run, which was especially stunning during the descent of the Rainbow Trail. The fallen leaves blanketed the trail and hid the rocks and roots, so my downhill speed was a little slower than normal, but I was totally fine with this as I wasn't looking to run too aggressively. - I only saw four people from the start at Dolly Copp to Glen Ellis Falls, and then about a dozen from Glen Ellis back to Dolly Copp. Getting to run the Rainbow - Wild River - Wildcat River trails without seeing another person while traveling under all the colors was a really awesome experience. As much fun as MMD is with the other runners out and about on the trails, there is something special about heading through this area all alone. - Overall, I had a very successful re-run of the route, my legs were a little heavy as this was my fifth mountain 50K in twenty-six days, but even with tired legs I still finished in just over eight hours (8 hours 4 minutes). Not a bad way to spend a fall day in the White Mountains! Map of route. This is from last year, this year I had to bushwhack through the woods to the Hayes Copp Ski Trail at the end of the Great Gulf Link as Dolly Copp Campground is closed do to construction. Heading up the Imp Trail, it's not one of my favorites as far as being attractive, but during the fall it looks much prettier. 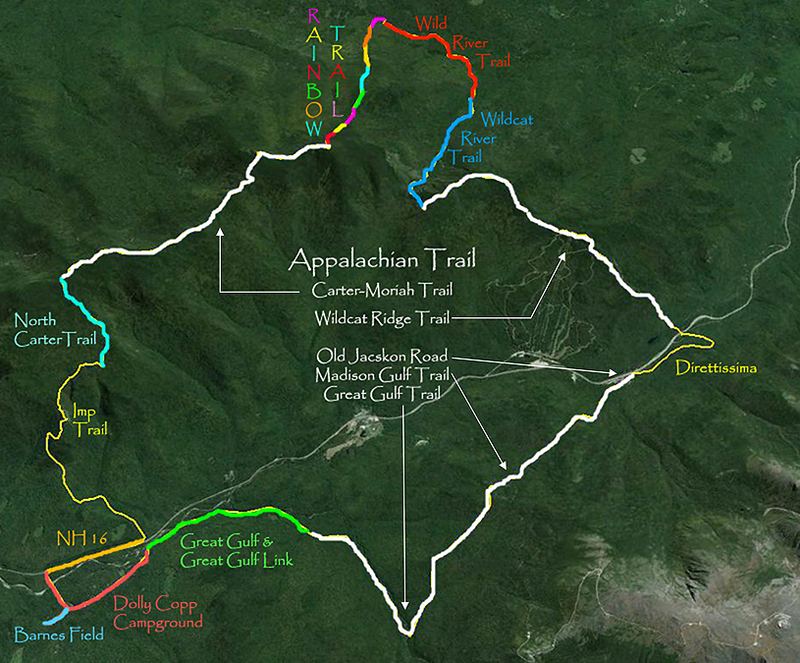 Put the Rainbow Trail on your foliage hiking list! Ellis River, the lowest I've ever seen it!